The central region of the small galaxy NGC 1705 blazes with the light of thousands of young and old stars in this image, taken by NASA's Hubble Space Telescope. At 17 million light-years away, the individual stars of the dwarf irregular galaxy NGC 1705 are out of range of all but the sharp eye of Hubble. NGC 1705 is an ideal laboratory to conduct investigations on star formation history. Young, blue, hot stars are strongly concentrated toward the galaxy's center, while older, red, cooler stars are more spread out. This galaxy has been forming new stars throughout its lifetime, but a burst of star-formation activity occurred as recently as 26 to 31 million years ago. This "starburst" is responsible for many of the young stars on the outskirts of the galaxy's core, as well as the central giant star cluster. NGC 1705 is classified as a dwarf irregular because it is small and lacks any regular structure. Many astronomers now believe that dwarf galaxies, like NGC 1705, were the first systems to collapse and start forming stars in the early universe. They represent the building blocks from which more massive objects (spiral and elliptical galaxies) were later formed through mergers and accretion. Nearby small galaxies are thought to be the leftovers of the galaxy-formation process. 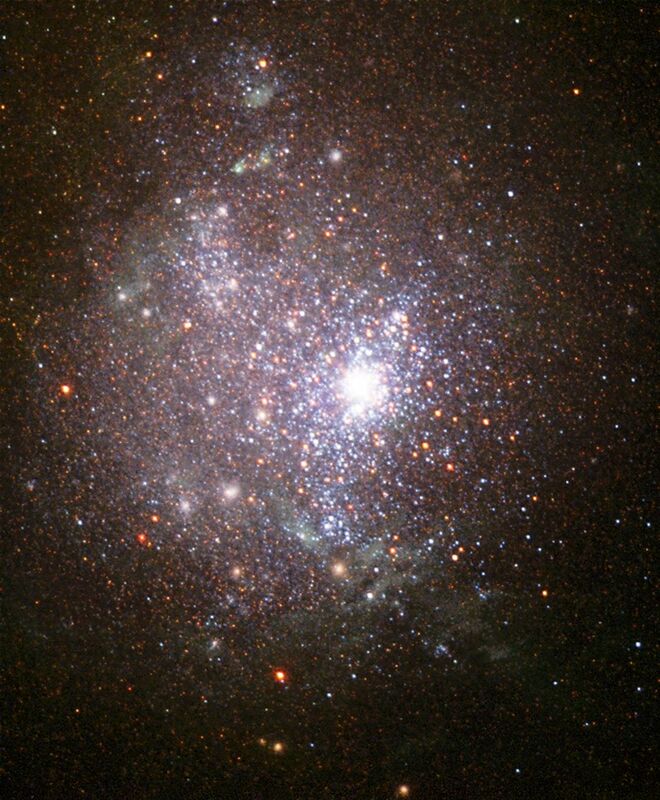 Dwarf irregulars are similar in many ways to very young galaxies, but they are much nearer and easier to study. These galaxies seem to have consumed only a tiny percentage of their reservoir of gas. 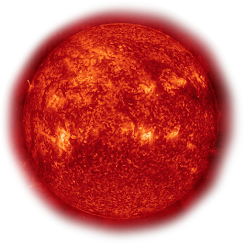 Their stars have a much lower fraction of heavy elements than does the Sun. These are all indications that only a few generations of stars have formed there over time. Current star formation is taking place at a fairly high rate in starburst episodes. All these characteristics make dwarf irregular galaxies the ideal local analogues to young galaxies from the early universe. Understanding their evolution is extremely useful and sheds light on the many processes related to galaxy formation and evolution. Dwarf irregulars play a key role in astronomers' attempts to unravel the history of galaxies in the early universe. These galaxies are probably best described as fairly old stellar systems whose chemical and physical properties can be ascribed to a process of slow evolution. The Hubble observations of the stars in NGC 1705 and other close irregulars have demonstrated that these galaxies are several billion years old. NGC 1705 could be as old as 13.5 billion years.